You can submit a job to an existing Cloud Dataproc cluster via a Cloud Dataproc API jobs.submit HTTP or programmatic request, using the Cloud SDK gcloud command-line tool in a local terminal window or in Cloud Shell, or from the Google Cloud Platform Console opened in a local browser. You can also SSH into the master instance in your cluster, and then run a job directly from the instance without using the Cloud Dataproc service. Job driver and log output: For information on viewing job driver output and logs, see Job driver output. You can specify a file:/// path to refer to a local file on a cluster's master node. To submit a job to a Cloud Dataproc cluster, run the Cloud SDK gcloud dataproc jobs submit command locally in a terminal window or in Cloud Shell. List the publicly accessible hello-world.py located in Cloud Storage. Submit the Pyspark job to Cloud Dataproc. Run the SparkPi example pre-installed on the Cloud Dataproc cluster's master node. Note: You can click the Equivalent REST link at the bottom of the Cloud Dataproc GCP Console Submit a job page to have the Console construct an equivalent API REST request to use in your code to submit a job to your cluster. Open the Cloud Dataproc Submit a job page in the GCP Console in your browser. Select your Cluster name from the cluster list. Set Job type to Spark. 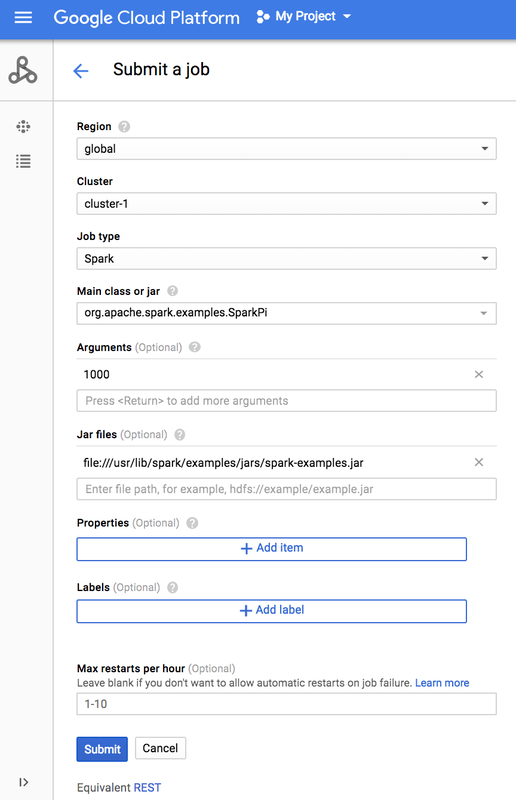 Set Main class or jar to org.apache.spark.examples.SparkPi. Set Arguments to the single argument 1000.
file:/// denotes a Hadoop LocalFileSystem scheme. Cloud Dataproc installed /usr/lib/spark/examples/jars/spark-examples.jar on the cluster's master node when it created the cluster. Alternatively, you can specify a Cloud Storage path (gs://your-bucket/your-jarfile.jar) or a Hadoop Distributed File System path (hdfs://path-to-jar.jar) to one of your jars. To add more arguments: Each argument must be entered in a separate text box. Press <Return> to open a new text box for each additional argument. Click Submit to start the job. Once the job starts, it is added to the Jobs list. Click the Job ID to open the Jobs page, where you can view the job's driver output (see Accessing job driver output–CONSOLE),. Since this job produces long output lines that exceed the width of the browser window, you can check the Line wrapping box to bring all output text within view in order to display the calculated result for pi. You can view your job's driver output from the command line using the gcloud dataproc jobs wait command shown below (for more information, see Accessing job driver output–GCLOUD COMMAND). Copy and paste your project ID as the value for the --project flag and your Job ID (shown on the Jobs list) as the final argument. If you want to run a job directly on your cluster without using the Cloud Dataproc service, SSH into the master node of your cluster, then run the job on the master node. 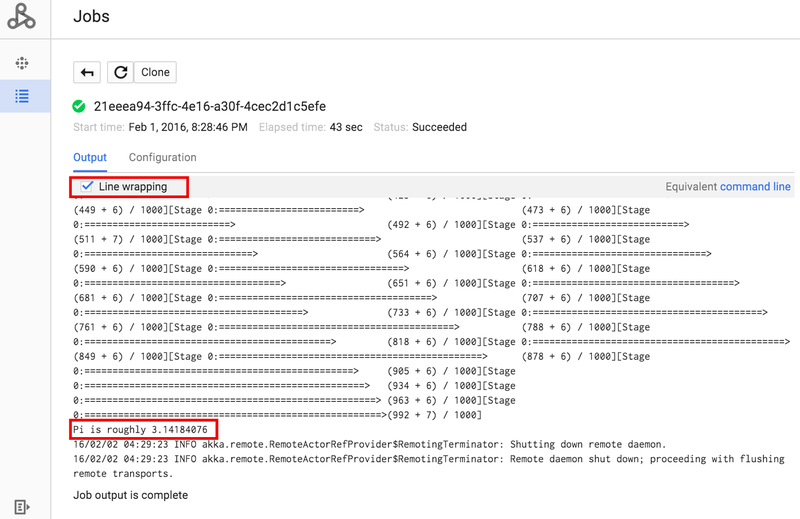 You can connect to a Compute Engine VM instance in your cluster by using SSH from the command line or from the GCP Console. Run the gcloud compute ssh command in a local terminal window or from Cloud Shell to SSH into your cluster's master node (the default name for the master node is the cluster name followed by an -m suffix). The following snippet uses gcloud compute ssh to SSH into the master node of cluster-1. Use the GCP Console to SSH into your cluster's master node (the default name for the master node is the cluster name followed by an -m suffix). In the list of virtual machine instances, click SSH in the row of the master instance (-m suffix) that you want to connect to. A browser window opens at your home directory on the master node. 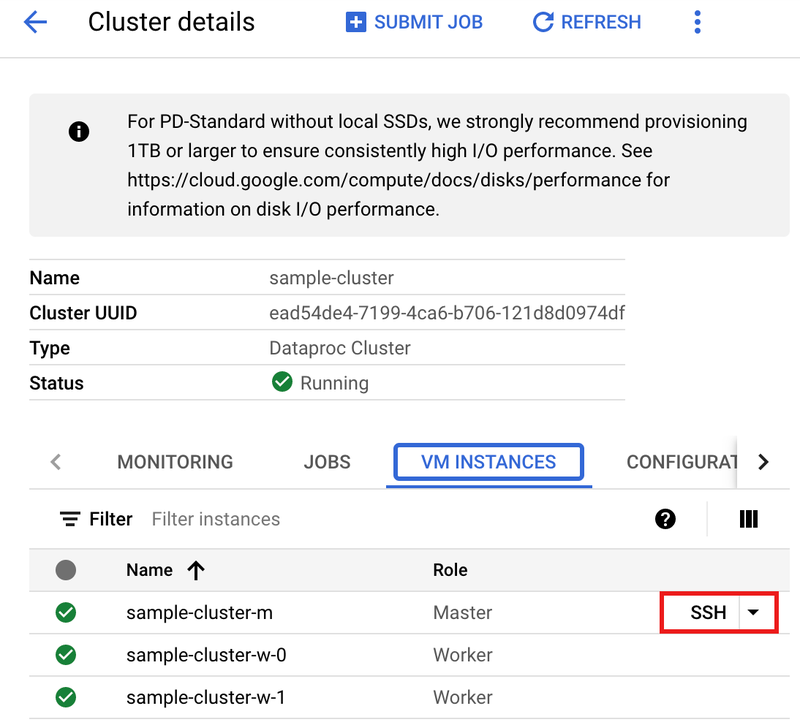 You can also SSH into a cluster's master node from your cluster's Cloud Dataproc Clusters detail page in the GCP Console. Run a simple Spark job to count the number of lines in a (seven-line) Python "hello-world" file located in a publicly accessible Cloud Storage file.